“We are thrilled to have Sister Hazel as our headline musical act, opening a weekend that will celebrate the creative spirit and imagination inherent in crafting and art,” said Mark Hill, President & Chief Executive Officer of the Association For Creative Industries, the event organizers. The inaugural “In the MKNG” craft festival will feature artists showcasing their talents in many ways including music. 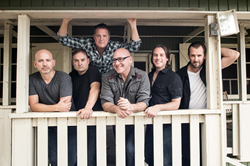 Festival organizers announced this week that Sister Hazel, which rose to fame in the 1990’s and has continued to build a loyal fan base, will be the headlining musical act for the creativity festival to be held at the Bethel Woods Center for the Arts September 29 and 30. Tickets are now on sale at http://inthemkng.com. The two-day festival will feature crafters from around the country exhibiting their creations to the 10,000 expected attendees. Hands-on demonstrations and interactive activities will highlight the main festival area while music fills the air as various national and regional artists take the stage to entertain the crowd. Sister Hazel will bring their blend of pop, folk rock, classic rock 'n' roll, and southern rock styles to the festival on September 29. The five-person band was founded in 1993. In 1997, they released the hugely popular “...Somewhere More Familiar” album which featured the hit single “All For You,” that rose to #11 on the Billboard Hot 100 chart and catapulted the album to platinum sales status. Several other musical acts will perform throughout the weekend and a full list can be found at http://inthemkng.com. The festival is currently accepting applications from vendors and sponsors. Nearly 40 artists, crafters, and other related vendors have signed on to be a part of the festival so far. Several sponsors have also joined including A.C. Moore, which will provide free parking to attendees, and Yard Yarn sponsor Lion Brand. Interested vendors and sponsors can email sales@inthemkng.com for more information. In the MKNG™ is a Hudson Valley festival inspiring and celebrating creativity across demographics and generations. Stemming from the phrase “in the making,” the festival highlights the creative process as one that is constantly in development. The event is organized by the Association For Creative Industries (AFCI) and includes live demonstrations, interactive activities, charity involvement, regional food, live music, and a lot of fun. The event is September 29-30 at the Bethel Woods Center for the Arts in Bethel, NY in the Hudson Valley. For more information about participating, visit http://inthemkng.com. Bethel Woods Center for the Arts inspires, educates, and empowers individuals through the arts and humanities by presenting a diverse selection of culturally-rich performances, popular artists, and community and educational programming. Located 90 miles from New York City at the site of the 1969 Woodstock festival in Bethel, NY, the lush 800-acre Hudson Valley campus includes a Pavilion Stage amphitheater with seating for 15,000, an intimate 440-seat indoor Event Gallery, the award-winning Museum at Bethel Woods, and a Conservatory for arts education programming. Through the in-depth study and exhibition of the social, political, and cultural events of the 1960s, as well as the preservation of the historic site of the Woodstock Music and Art Fair, Bethel Woods educates individuals about the issues and lessons of the decade while inspiring a new generation to contribute positively to the world around them. The not-for-profit organization relies on the generous support of individuals, corporations, and foundations to develop and sustain programs that improve the quality of life in the region and beyond. For more information please visit http://BethelWoodsCenter.org.